Some time ago, I conducted a seminar about living a life of quality and significance, about becoming the person you were born to be (QLM: Quality of Life Modeling). It seems to me that many people, particularly in the first half of their lives, continue to struggle with how to achieve this; consequently, I’d like to share an aspect of that seminar here (more to follow in future posts). For anyone seeking to go beyond oneself, and one’s own perceived limitations, it is tremendously helpful to adopt a strategy of success and achievement. In my QLM Seminars, we underscored the importance of learning from adversity and understanding that nothing can be called a failure unless you accept it as such. In fact, it can be said with confidence that there is no failure in life, there are only the results and outcomes of our thoughts and actions. 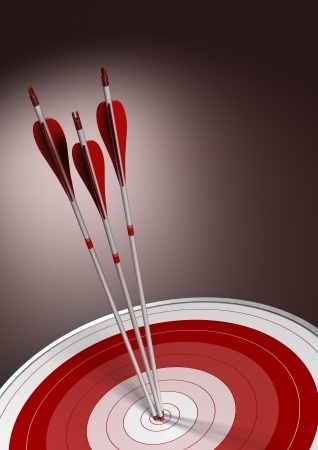 Hitting the Mark requires strong goal setting and a powerful feeling function. It helps to step back from a situation and assess it as though you were standing outside of it – what were the results of my actions? Were they what I wanted? If not, what information can I take from these outcomes to adjust my strategy to achieve a better result? Learning from adversity is a powerful experience, and can help you sharpen your strategy and thinking; it can help you to more purposefully align your thinking functions with your feeling functions, allowing you to pursue what your soul truly wants in a thoughtful and strategic manner. Learning to set goals and applying effective strategies to achieve them is a crucial aspect of especially the first half of one’s life; it is a part of your Hero’s Journey. With this skill mastered, you can apply it your soul’s true calling, that which goes far beyond one’s own ego and desires. Perfectly aligning your ego with your soul goes beyond mere goal setting – it is fulfillment of the sacred calling we each have.